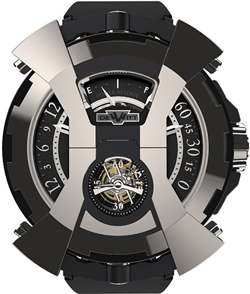 Company DeWitt presented at the annual international exhibition hours BaselWorld 2012 Watch-Concept – X-watch, in fact, continue the theme of its original clock with swivel housing. Watch X-watch – this is the third the concept presented by the company. The first concept of this series was presented in 2005 at the famous hour auction Only Watch, which is traditionally held to support research to combat Duchenne muscular dystrophy. The second concept was introduced in 2007 – then it was an extremely complex piece of watchmaking art – a concept watch – WX-1. 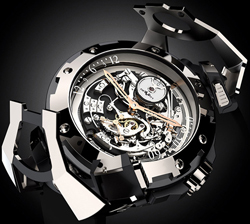 The concept of X-watch – the third, he became one of the most unique exhibits BaselWorld 2012. Its external form watch X-watch is no longer resemble the clock, and the mixer, which gives the product a certain playfulness and artistic expression. In addition to a master association of the company added an unusual concept of sliding cover in the form of X, which partially covers the face, and is a main feature of this model. An interesting method is movable cover that part of the mechanism is concealed by the fine play, overlapping layers of the mechanism. By the way, this technique is used in the DeWitt master their products quite often. The cover, made in the form of X, is powered by four buttons, which are located in the upper and lower parts of the body. Pressing gently pushing in the middle of the lid, revealing look at the dial. Among other things, a unique cover is equipped with a special mechanism that regulates the speed of the lid. Watch case diameter of 49 mm and made of titanium Grade 5 may be reversed only when the lid is opened. That’s when you can flip back and lock the lid closed. The basis of the concept became a manufactory caliber DW 8046 – a unique development company. Caliber is the world’s only double-sided clock mechanism, equipped with a double retrograde hour and minute hands, which are located on both sides. The mechanism, among other things, has a chronograph and tourbillon, as well as automatic sequential factory ASW with peripheral rotor. DW 8046 caliber is 544 parts, presenting a unique example of the ingenuity and creative freedom and the courage to master DeWitt.